Perfect for creating a scene or cover for your next document - personal or commercial. This set will provide you with 16 basic 'scene backgrounds'! 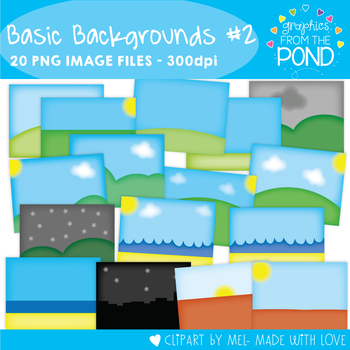 Layer clipart over these images to create your own fun page scene! I have also included another 16 images as blackline options as well. They CANNOT be shared or distributed as image/clipart files for any reason. You cannot make your own clipart/image files with our clipart files for any reason - advertising, buttons, memes etc. You must create a document with them where the images are embedded. You can create a teaching document file with them where the images are embedded and credit is included within the file. Not your own clipart or any other type of image file for display or distribution. You are able to use them commercially, within a document that you sell or give away, by giving us a simple credit in your file (instructions are given in the zip file when you download).